Forgive me, George O'Connor, for I did sin: I was way harsh on Aphrodite before I'd read the rest of the series. Now, I've done a total 180 and I absolutely adore these graphic novel retellings of Greek myth. It's clear that O'Connor loves the subject matter, and I really like that the gods and goddesses are as diverse as the people who would have worshiped them. Ares isn't exactly the most popular god on the block, although I did find Rick Riordan's incarnation of him as a biker dude kind of spot-on. Ares: Bringer of War draws heavily from The Iliad, but O'Connor helpfully includes end notes and little explanations in the text to help the reader along. 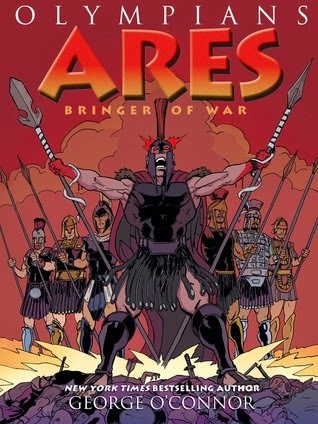 What's interesting about this volume is that O'Connor not only talks about Ares as a god, but also as a father, which isn't really an aspect I'd considered before. When you think about Greek gods having children with mortals, you generally think of Zeus, because wow. That dude was creative in his prolific seeding of the world with godlings. As the gods go back and forth about how involved they are allowed to be in human affairs--specifically the Trojan War--the readers get to see that the gods were interested not only because of the ill-fated beauty contest with the golden apples, but because so many of their children were involved. Additionally, certain gods were patrons of certain cities, so although their child might be fighting for one side, they felt obligated to also protect their city, which belonged to the enemy. Yep, things got messy really quickly. The Trojan War isn't really a *fun* topic, but O'Connor injects a bit of levity into the story with some of the in-jokes amongst the gods. I appreciated that he stayed focused on the horrors of war, however, and the futility of this battle wherein so many brave soldiers were killed. I've never fully appreciated the offense of the treatment of Hector's body until this book, where you see that even the gods are horrified at Achilles' act. Highly recommended, particularly for mythology geeks (represent!). I received a review copy of this title from :01 Books.